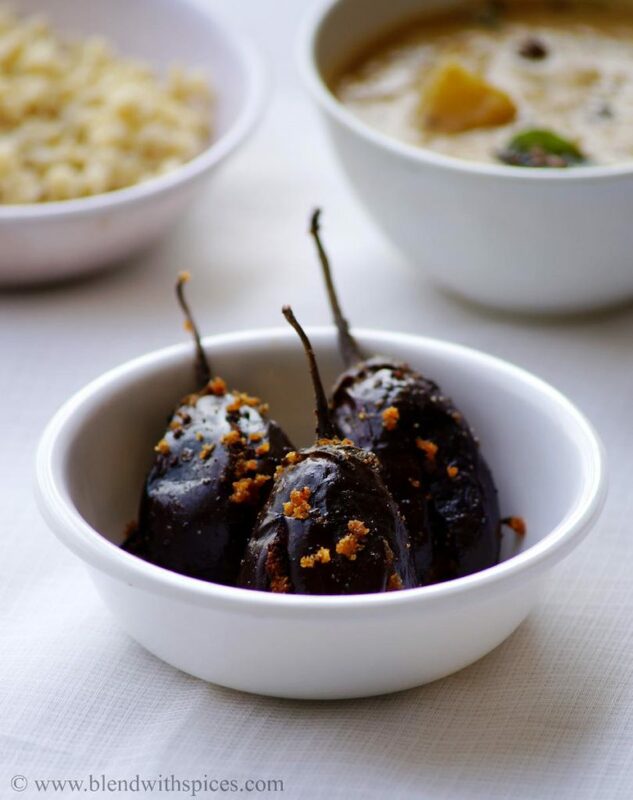 If you are looking for more Brinjal Recipes then do check Eggplant Sambar, Senagapindi gutti vankaya, Brinjal Lobia Curry, Gutti vankaya ulli karam and Vankaya Pappu. Heat a teaspoon of oil in a pan and add the coriander seeds, chana dal and urad dal and fry them on a medium flame till they are golden brown color. Remove them from the pan and set aside to cool down. In the same pan, add and fry the red chillies for minutes. 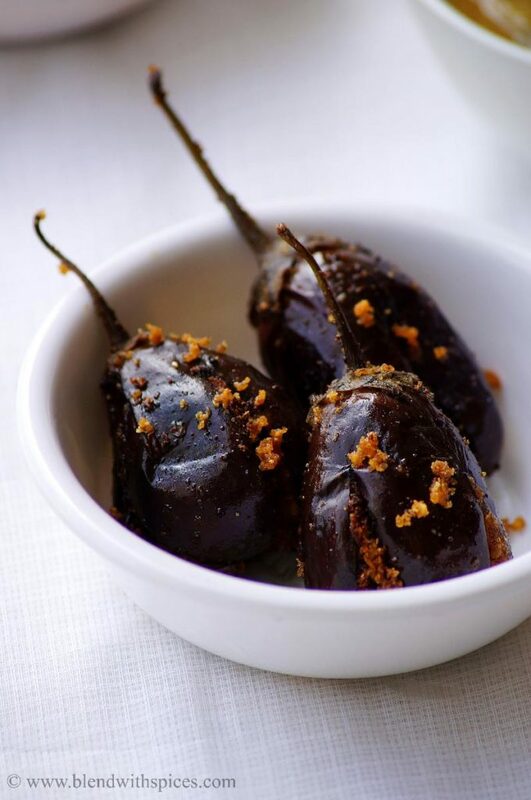 Grind the roasted ingredients, dry coconut, salt and roasted red chillies into a fine powder and set aside. Wash the eggplants and make a plus (+) slit on the bottom of the eggplant. Keep one end intact. Now fill the stuffing powder into the brinjals. Heat oil in a wok. 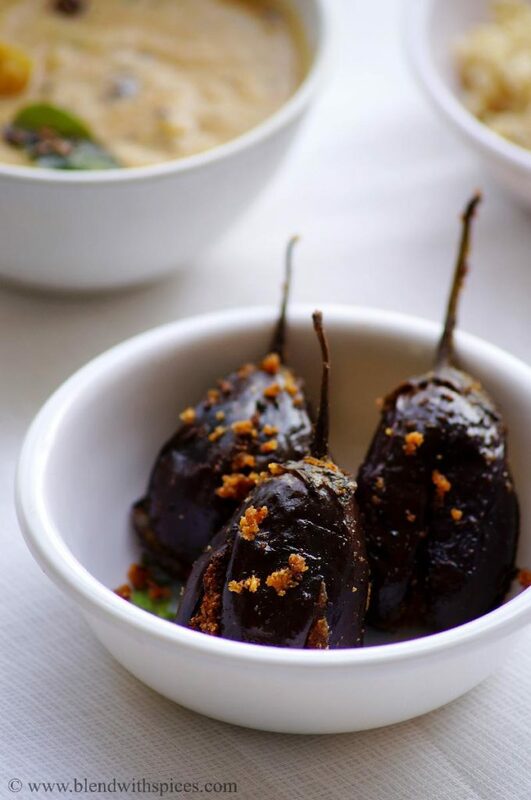 Place the stuffed eggplants carefully into the wok and cover it with a lid. Let it cook on a low – medium flame. Keep checking in between and turn the brinjals a little until they are evenly cooked. When they are soft, turn off the flame. delicious and my favourite stuffed brinjal curry. Very inviting to look at brinjal recipe. Excellent preparation. Never try this stuffing in brinjal…looks so yum..
Just tried your recipe, it was a big hit!